Even though treaties exist for Native American tribes, they are not always upheld. In the Treaty of Medicine Creek, Northwest tribes were given fishing rights along the waterways, but now there are almost no healthy fish left for them because of coal shipping operations. Discusses the question if Indians still exist. 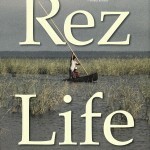 Rez Life, the book by Native author David Treuer, gives an insider’s view of Native American history and modern day life on the reservation.